When in 1555 Philips II became the Lord of the Netherlands he wanted to crush both the religious reformers and the people who defended the rights of the 17 semi-independent states that made up the Netherlands. If he had compromised with the religious reformers he might have won the centralisation, if he had had respected some of the traditional rights of the rulers and ruled, he might have defeated the religious reformers. He did not compromise with either group, and also tried to subdue Protestant England, the Protestants (Huguenots) in France and on top that fought against the naval dominance of the ‘heathen’ Ottoman Turks in the Mediterranean. The wealth of Spain’s American colonies was not enough to pay for all these wars. Spain was dependent on mercenaries to fight its wars and during the 80 years war in the Netherlands there were many mutinies because the soldiers were not paid. The mutineers of course happily robbed both ‘rebels’ and ‘loyalists’. Philips regained control over the south of the Netherlands, what is now Belgium, but at great cost. The wealthy industrial and trading centres came to a virtual standstill, and population numbers went down dramatically, through casualties of war, persecution and mass emigration. The North of the Netherlands profited greatly. Skilled workers and experienced traders with Europe wide connections settled in northern cities. These immigrants often were ardent Calvinists and strengthened the church in the north. Jean Calvin taught that citizens had the right to revolt against unjust rulers. Willem van Oranje wrote about a contractual relation between the ruler and the ruled and that a contract can be broken if the ruler does not stick to the rules . In modern terms we could say that the ruler has a duty of care for the people she/he rules, ideas that were also developed in India for the Hindu and Buddhist rulers on the sub-continent. Philips II ruled over a vast Empire, including most of South America, but like Aurengzeb, the last of the great Moghuls, his rule was the beginning of the end of Spain as a world power. The Republic of the Seven United Netherlands is now one of the few remaining Kingdoms in Europe, and the Queen is a descendent of Willem van Oranje. Young Willem was a Lutheran when he inherited the title of Prince of Oranje, but at the court of Charles V he was brought up as a Catholic. Finally he became a Calvinist but he was one of the few people who tried to see the other side of the argument. We are getting near to the reign of Philips II. In this article I will discuss the arrival of the reformation in the Netherlands during the rule of his father Charles V.
From about 1520s Martin Luther’s teachings reached the Southern Netherlands, from about 1530s the first Anabaptists arrived and Calvinism, the teachings of the French reformer Jean Calvin, came to the Netherlands from about 1540. Calvinism turned out to be the dominant Protestant religion in most of the Netherlands. The Roman Catholics were absolutely convinced that theirs was the only right Church. Equally most Protestants, and especially the Calvinists, were absolutely convinced that they were right. More Protestants ended up martyred than Catholics in this religious conflict, but there were definitely Catholic martyrs too. During the religious conflict in Flanders periods of relative peace were followed by periods of violent conflict. The persecuted Protestants attacked Catholic churches to remove the statues (Iconoclasm). They were strongly against any statutes of Jesus and the saints. They also killed priests who were suspected of betraying them to the authorities. In periods when the Protestants had the upper-hand in certain areas, the Catholics did not have an easy time, and that included Catholics being killed. In the decrees issued against Protestants the punishment for those who did not want to return to the Catholic Church was to be buried alive (women) or to be burnt alive (men). I have statistics for Protestant martyrs for the period from 1523 till 1556 in Antwerpen, Aalst, Brugge, Brussel, Doornik, Gent, Ieper, Kortrijk, Nieuwpoort and Oudenaarde. Most of these cities are in Flanders, some are in Brabant. Philip II succeeded his father as Lord of the Netherlands in 1555 and left for Spain in 1559. From 1523 till 1559 289 Protestants were executed because of their faith. In March 1564 Cardinal Granville, an enthusiastic persecutor of Protestants, was forced to leave his post in the Brussel’s government. From 1559 till March 1564 122 Protestants were martyred. In August 1556 systematic attacks on Catholic Churches started, destroying statues and other Catholic paraphernalia, and also killing priests and other functionaries of the church. From 1564 till the 1556 Iconoclasm 19 Protestants were martyred. Harsh punishments were common, and both sides were convinced they were absolutely right, and that the other side was absolutely wrong. And although Willem van Oranje tried to mediate, neither side listened to him. Before we start discussing the reformation in the Netherlands I want to have another look at the early industrial cities in Flanders. First a technical matter : the laken that was produced in these cities was made of wool, first of Flemish wool, but when the production increased most of the wool was imported from England. The situation in Flanders in the early 14th century was complicated. The Counts of Flanders had two conflicts on their hands: French King Philippe le Bel wanted to regain control over the County of Flanders. The industrial cities, ruled by a new élite, tried to be as independent as possible of the Counts. The final complication was that the craftsmen, who actually made the wool into the precious laken, also wanted a say in the running of the cities. The French King supported the city’s élite against the Count of Flanders and the Count supported the craftsmen against the city rulers. These rulers were also the guild masters, or in modern terms, the industrialists. Whatever Flemish nationalists might tell you, this was not about Flemish or Netherlands’ nationalism, nationalism was invented in the 19th century. The Count thought of Flanders as a possession of him and his family, and the King thought of the Count as somebody who on his behalf ruled over part of his property. Within the cities, or between the cities and the count, the issue was not democracy. These industrial cities were a new power in the land, and they were looking for privileges and influence. When the craftsmen realised their power (no craftsmen no laken) they also demanded a share of the influence and wealth. The development of powerful industrial and trading cities brought new groups into the political process, which made it more difficult to control areas like Flanders and later Holland and Zeeland. Cities like these did not just exist in Flanders, Holland and Zeeland. Antwerpen and Bergen-op-Zoom (Dukedom of Brabant) at the mouth of the river Schelde were good examples of non-Flemish trading cities. In most of their country the Kings of France regained full control, but Flanders went its own way, and ended up under the rule of the Habsburgs, together with almost all the other states of the Netherlands. The Habsburg Netherlands were like a confederation linked to each other by a personal union, as each of the component parts had the same ruler. But each county or dukedom had a different set of rights and duties for the ruler and the ruled. There was also not a standard set of privileges and duties for the cities, neither within the Netherlands as a whole, nor within each state. Guru Nanak wrote his slok about playing the game of love while carrying your head on the palm of your hand. Guru Gobind Singh asked us to offer our head to Guru. True love, true devotion makes you willing to give all. True love, as Saint Paul writes in his letter to the Corinthians, does not seek itself and is unconditional. Part of the Gursikh’s way of life is this unconditional love for The One, the Limitless, the Timeless, Who was not born, Who will not die. It becomes easy to offer this love once we realise that God pours out boundless love over all of us. Guru writes about the true marriage where there are two bodies and one soul. The marriage of the soul-bride with the God-groom does not involve bodies, here the soul-brides (all souls, whether of men or women) merge fully in the All-Soul, as a drop of water merges in the ocean. We agree with the Ibrahimic religions that the soul is eternal, but we do not believe in life after death. At the end of the cycle of birth and death the soul is not destroyed, but returns to the All-Soul and loses its individuality. The other difference is that we believe that all life forms, from the most primitive to the most sophisticated, have souls, and that the cycle of birth and death is a journey from the All-Soul through primitive life forms to the only life form that has the ability to make moral choices, mankind. But mankind is often bound by the ‘five thieves’ : kám (lust), krodh (anger), lobh (greed), moh (attachment) and ahankar (pride). We do not recognise that if we do not control these enemies we are losers. Since I started walking on Guru’s path I have made progress against all the five ‘thieves’, but I find that especially kám and krodh do not relent. I live an unhealthy life, a single male living in the Gurdwara with other males, which does not help. From June 2008 till June 2010 I lived on my own in a Southall bedsit, but was able to develop good friendships with both men and women, Sikhs and non-Sikhs, which made it much easier to deal with ‘kám’. Offering your head, giving all, will not work when you are obsessed with any of the 5 thieves, or if you are too attached to worldly goods. Merging in the One means giving up Me, Me, Me and changing to Us, Us, Us. Getting near to God means also getting near to Creation, to your fellow humans, and to all other creatures that are equally part of God. God is All, All are God, all the noses are God’s noses, all the eyes are God’s eyes, all the feet are God’s feet. The spiritual path will heal the isolated lives that many of us live in our post-modern western society. I am asking you all as I did in a previous article called : ‘Are you connected ?’, or in other words have you got a link with God, are you at one with God and Creation ? According to most historians you can only call a society a civilization when it has cities. The Sumerian civilization in present day Iraq had an efficient agricultural system. The farmers did not just grow enough food for themselves, they were able to feed cities with a non-farming population of administrators and artisans. In the Netherlands the first real cities date from Roman times. But the cities in the Medieval County of Flanders, and later in the county of Holland and Zeeland, were ‘stage two’ cities. They were not just administrative centres and marketplaces where artisans and farmers bought and sold. Brugge (Bruges), Gent (Ghent) and Ieper (Ypres), cities that people from outside Belgium will know, were producing textile on an industrial scale, and this produced a fabulous wealth. Just think about the magnificent Lakenhal (Cloth-hall) in Ieper, built by the guild of cloth (laken) producers. With industrial ‘power’ also came political influence. The Counts of Flanders were looking for contributions from the wealthy cities to run their government, to run their courts and to fight their wars. The Cities paid their dues but with that ‘bought’ privileges for their ‘poorters’ (Stadspoort = City gate). 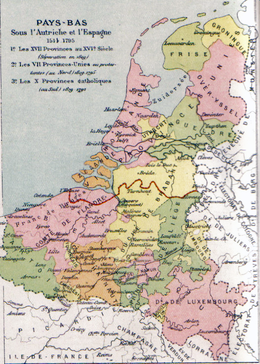 Most of states that made up the medieval Netherlands were part of the German Empire, but Flanders was part of the French kingdom. Under weak French Kings the high nobility of France, like the Dukes of Burgundy, the Duke of Brittany, the English Kings (who ruled parts of France) and the count of Flanders ‘ruled’ the King, but strong French kings tried to rule the nobility. Towards the end of the middle ages most of the Netherlands’ Counties, Dukedoms and Bishoprics had become part of the ‘empire’ of Burgundy, and that empire was inherited by the Habsburg family. These new rulers were Counts of Flanders, Counts of Holland, Dukes of Guelders, Dukes of Brabant etc, but the Habsburgs tried to centralise government weaken the privileges of the states and cities. The French Kings had to deal with powerful nobles who ruled parts of their country. The Burgundians and Habsburgs inherited these positions themselves. But they were confronted by powerful cities and their patricians and craftsmen. It was in Flanders, Zeeland and Holland, where there were powerful and wealthy cities, that the religious reformation of the 16th century was most successful. King Philip II had to cope with an independent-minded population that did not want give up its privileges, and many of whom were ardent supporters of the protestant reform movements. This discussion has been caused by reading books by Belgian authors on the subject, especially ‘Geuzen in de Westhoek’ by Roger-A. Blondeau (1). The Dutch history books that I studied in primary school contained too much protestant propaganda, but some of the books by Roman Catholic Belgian authors are equally biased. I am not trying to deny that both sides in the conflict used extreme violence, what I am trying to do is to present a balanced view. The Netherlands that I write about included the present countries ‘Nederland’, ‘België’ and ‘Luxemburg’, plus a substantial part of Northern France. To illustrate this I will reproduce one of the old maps of the area that I have used before. I these articles I will try to describe some of the processes that led to the armed conflict between the western counties of the Netherlands and the central authority, formally based in Brussel, but in reality in Madrid. The first conflict I will describe were the complicated relations between the élite of Flemish cities like Gent and Brugge, supported by the King of France, and the count of Flanders, who was supported by the craftsmen of the guilds. The second conflict was between the various states that made up the Netherlands and the central authority in Brussel. Brussel (Madrid) wanted to unify and centralise, the various states wanted to retain or even expand their autonomy. The third conflict was related to the religious reform movements started by people like Martin Luther, Menno Simonsz and Jean Calvin. Philips II demanded absolute obedience to the Roman Catholic Church, some of the reformers wanted to transfer this absolute authority to the Calvinist church, while people like William of Orange wanted to allow a degree of religious freedom. One of the features of the period under discussion is that the County of Flanders in the 1300s already had a good numbers of cities whose wealth was based on trade and industry and not on agriculture. The other relevant process is that through inheritance and conquest the states that made up the Netherlands became part of the Burgundian ‘empire’, which in the 1500s was inherited by Charles V of Habsburg. Although there was a ‘States General’ (representation of the burghers, nobility and clergy) for the whole area, Charles was the ruler of about 17 small states, each with its own laws and traditions, and not of one country with a strong central government. I think that reading these articles might also enable a better understanding of some of the conflicts between the Sikhs and the Moghul Empire at the time.